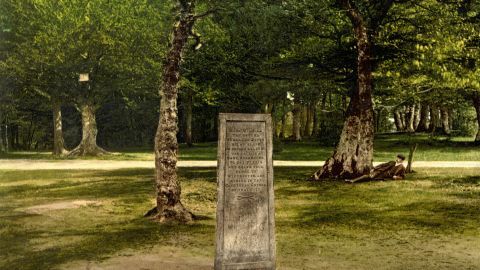 Wilton is a place of great antiquity, and its importance is indicated by the circumstance of its having given name to the county. It was the scene of one of Alfred’s victories over the Danes in 871; and the occasional residence of the West Saxon Kings. A Benedictine abbey, for nuns, existed here at an early period, of which Alfred, and his successors, were great benefactors. The church was the abbey church. The new church is an elaborate imitation of the Lombard style, on which the Norman is founded. There is a county cross. It has much declined of late years: the population are partly engaged in the cloth and carpet factories. At that of Messrs. Blackmore, the Axminster carpet, shewn at the Exhibition, of 1851 from Gruner’s designs, was manufactured. It is rather curious that this branch of manufacture was first introduced into England by a Frenchman of the name of Duffoly under the protection of the Herberts, in Elizabeth’s time. Wilton Castle is built upon the site of the abbey; it was rebuilt by Wyatt. Here Sidney’s sister, Pembroke’s mother, lived, and Sir Philip wrote part of his Arcadia. The old castle was altered by Holbein and Inigo Jones, and visited by Charles I. Here may be seen the old rusty arms of Sir William Herbert ap Thomas, which he wore, when in France with Henry V. There is a fine collection of marbles, and portraits by Vandyke; Titian, by himself; Richard II., supposed to be the oldest oil painting extant; pictures by Rubens, &c. The park is beautifully timbered, having many very aged trees. John of Wilton, of the thirteenth century; John of Wilton, in the time of Edward III. ; Thomas of Wilton, in the time of Edward IV. ; and Massinger, the dramatist, were natives. 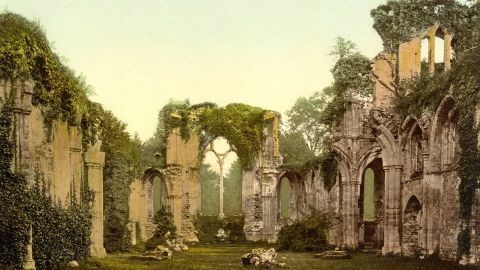 Remains of the church, chapter-house, refectory, &c., exist, all picturesquely wound with ivy or overshadowed with ash and other trees. 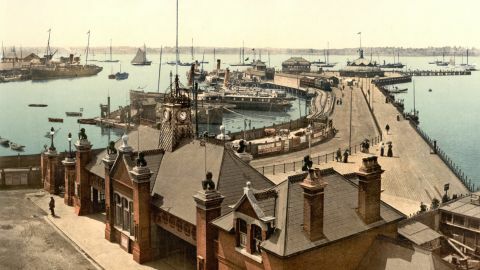 The station, which is close to the quay, and has a commanding position on the banks of the Southampton Water, is admirably adapted for the convenience of passengers. Old capital of the British Belgoe, county town of Hampshire, a bishop’s see, and parliamentary borough; stands among round chalk hills, sloping down to the Itchen.